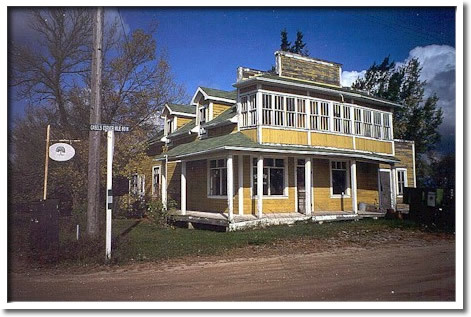 The former H. Gabel’s General Store is one of the best surviving examples of a classic boomtown-style country store. It was constructed in 1929-31 for its owners, Henry and Mary Gabel, who operated the store until it closed in 1975. The enterprise survived the competition of mail-order companies and franchise chains, because of the nature of the local market in which it operated. The store was designed by Roy Millbrant of Beausejour and built with the assistance of Steve Chipilski of Ladywood. The two-storey wood-frame structure, with a verandah and second-storey balcony, is clad in drop siding. A false-front with a stepped-gable pediment and dormer windows give additional height to the building. Tongue and groove maple floors and ceiling, oak columns, display cases, weigh scale, vault, cash box and wooden drink cooler are original to the former store. It now serves as a museum with a 1930s country store theme and an artist’s home and studio.